"Guess who just got back today..."
Things have been heating up here in Southwest Florida. After a week or two of temperatures in the upper 70's/ low 80's, the water has warmed considerably; enough that the bull sharks have pushed back in! These are not the numbers you'll find once the tarpon come up and fish start moving out of the backcountry, but they are consistent if you want to target them. Saturday turned into a rather spontaneous sharking excursion. Having not dropped baits since well before Christmas, I was ready to run the big rods. After a long class on Saturday morning, and finishing up an ecology paper, some texts were sent, plans were made, and soon enough the lean, green, fish machine was loaded down with rods and putting towards the beach. After fighting the island traffic I picked up my beach bum friend Phillip, took a quick pit stop at the taco stand, and headed to the marinas. Several boats had just docked and were unloading their hauls with one boat coming in with two big amberjacks that bottomed out the 50lb scale. After the captain filleted these beasts we took the carcasses and crammed them in our tiny cooler the best we could and headed out to Sanibel Island. Right before the Sanibel tollbooth sits the Punta Rassa boat ramp. If you catch it at the right time when the boats are coming in you can cash in on some good shark baits. There was plenty of time to kill so we stopped by to check and were rewarded with a bucket full (and then some) of huge red grouper carcasses. We were loaded down with more bait than we could handle at this point, and headed over the series of scenic bridges that comprise the causeway to Sanibel Island and one of our most successful shark spots. We busied ourselves rigging up and getting ready while we waited for the others to show up with the kayak. I launched the surf rod out first thing with a chunk of belly meat from one of the groupers. We dug the sandspikes in and had the 80w and the 9/0 set up and ready to go. The big 80w occupied the northern edge of our spread, so it could be run the furthest out and away from the others, increasing the chances that it would get hit first by any shark coming from that direction on the beach, and also adding insurance that if a fish did indeed hit, it would not cross the other lines being so far out and away. To the end was rigged one of the big amberjack heads and the 9/0 was set up with a grouper carcass. To the trailing hook on each rig was tied a rock weighing several pounds and secured with 20lb test monofilament line. These would serve to anchor the bait, but be easily bitten off when a shark moved off with it. The baits now sat rigged and ready at the water line waiting for the kayak to show up. Big AJ head rigged with double 13/0 hooks awaiting deployment. Finally everyone else arrived and baits starting going out one by one. Most rods were rigged with smaller grouper carcasses, and upon seeing the large amberjack I had rigged I was chided for wasting such a perfect bait in the dead of winter when there were supposed to be no sharks around big enough to eat it. Nevertheless, I had faith and it was yakked out. I had asked my friend Matt to make it a far drop, and after clearing the breakers he kept going out. The 130lb mono topshot slowly disappeared and the knot to my braid served as a reference point as I watched it slip silently and smoothly through the roller guides and off toward the horizon. About 200 yards into my braid the line stopped going out and I saw the headlamp far out off the beach come about and begin growing brighter, signaling that the bait had been dropped and Matt was coming back in. About 400yds out it the bait now sat waiting to be found. The rest of the rods were run and the wait began. A friends big 14/0 was the first to get hit, but the hooks never found purchase and the shark swam off with the bait having never felt them. After another hour and a little catfish on the surf rod later, my Avet 80w down the beach began it's high pitched growl that set it apart from the "clack-clack" of everyone else's Penn Senators. I worked the rod out of the holder and pointed it toward the fish as line poured off the spool while it ate. After I determined it had the bait long enough I pushed the drag up into the "strike" setting and maneuvered the rod up and rested it on my shoulder. As I felt the line begin to come tight, I ran forward away from the water to take the stretch out of the springy monofilament and pumped the rod to set the hook. After 20 feet I could feel the fish on the other end and turned around while winding tight as I made my way back to the water. I worked the fish a bit and everyone watching debated as to whether or not there was actually a shark on the end. I knew it was there however; not a huge fish, but there was definitely something there. Philip had not yet landed a big shark of his own and so I handed him the rod so that he could have the experience and gain some bragging rights. 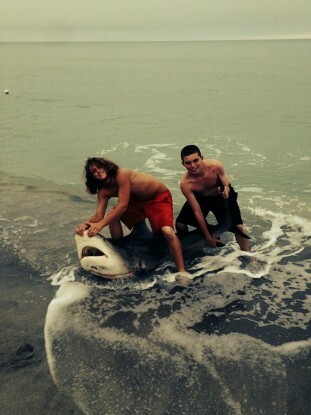 After a half hour battle he had a nice 6'6" bull shark cutting back in forth in the swash. Working quickly to leader and tag it, it was soon revived and quickly made for deeper water. 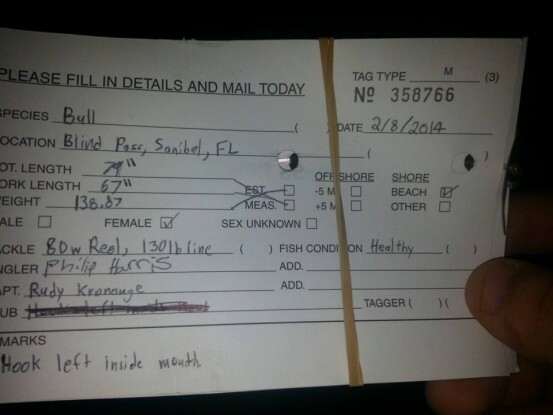 Mail-in info slip for the tag we placed in the bull. The bull had run parallel to she beach during the fight and crossed a few lines. After clearing and untangling rigs we tied on fresh leaders and I rigged up the second and last amberjack head on the 80w. The 9/0 leader had been bitten off and we decided not to put it back out. Our designated "bait yakker" Matt offered to run the rigs back out only if we ran to stock up on snacks at the gas station, so off we went. Except the car wouldn't start. We determined the phone charger had killed the battery, but after a quick jump we made our thunder run to the 7-Eleven. After everyone stocked up on doughnuts, funyons, and slim jims, and I grabbed a coconut water and an energy drink for myself , we got back to the beach. While we were gone the rest of the crew had beached a small blacktip, but nothing else had happened. We refueled ourselves with late night junk food, sent the baits back out, and settled in to wait for whatever would hit next. In the meantime a group of about 8 guys came up and set up right next to us with a bunch of inshore rods- and said they were there to shark fish. As a joke we walked down and gave them the chewed-up amberjack head from the last shark as bait. They fished for awhile without much success and packed up and left before too long. 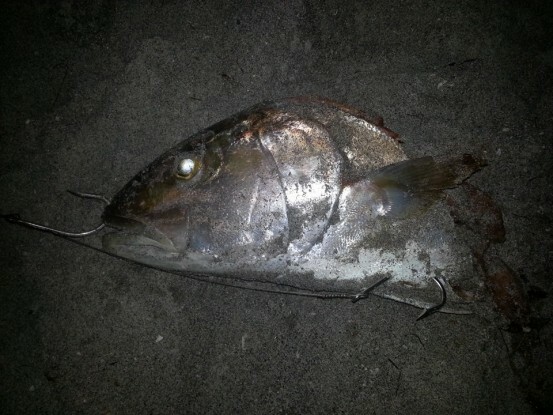 At around 1:00 a.m. the 80w with the second amberjack head began rolling again. This time the run was faster and much more steady; meaning the fish had been able to fit the bait in its mouth the first bite and didn't need to pause to re-position it. As with the first shark I got the rod out of the holder and continued to let it eat. 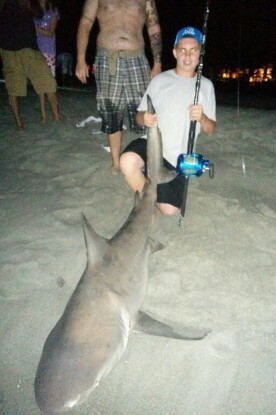 Because this was such a large bait I gave the shark plenty of time, about 20 seconds, to run with it. It seemed like a lifetime had passed before I felt it was time and again threw the rod on my shoulder and began running and pumping. This time though I felt much more pressure as the slack came out of the line and the rod surged with each headshake as the fish felt the sting of the hook. I worked the fish standing up until I realized it was much bigger than the last one and I sat down in the sand for a more comfortable position. This fish definitely had much more heft and fight to it than the last bull. While I was fighting it another rod went off and we had a double hookup. Soon, however, my fished stopped pulling, but oddly also stopped coming in. I put the reel into low gear and pushed the drag up to full and started cranking away. The line got tighter and tighter until all the slack was out and the drag began slipping. The rod tip was bent over but remained motionless. The shark on the other rod had done the same. We knew what had happened. Both fish had managed to wrap themselves up on one of the numerous crab pots that made a virtual minefield right off the beach. I continued pulling on my fish while the other was given slack. The other shark began swimming back out, but the line did not clear the buoy rope and rubbed until it broke. My fish still remained tied to the crab trap. I pulled for an hour, resting the rod on friend's shoulders and hand-winding line onto the reel in a vain attempt to drag the trap in along with the shark. It was useless. I backed the drag off and placed the rod back into the rod holder as we tried to decide what to do. 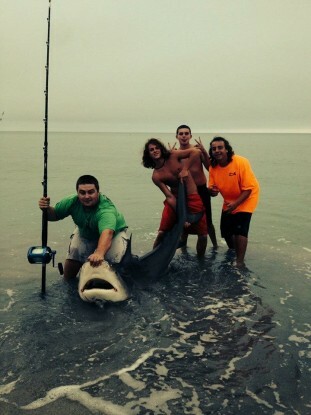 We knew the shark was still out there, but it was a matter of whether or not we should kayak out and try to free it. My friend Matt finally grabbed my bait knife and paddled out to see what he could do. He got to the line and cut away the buoy. He started pulling on the trap line when the fish's tail came up looking massive next to the kayak, and understandably he came back pretty quick. The shark was still wrapped up. After much going back and forth on what to do I saw two options. I could cut the line and start fishing again, while the shark would remain wrapped up and be dead and lost. Or I could leave the line attached until dawn and go back out again and try to free it, and while it would most likely be dead, we could at least get it in for pictures and see if any marine laboratory wanted it for research. Ultimately we went with the second option. With my 80w out of commission for the night I sat with everyone else while they fished. No one stayed for much longer though. Another blacktip was caught by Dylan, and everyone except Philip, Matt, and myself went home. We had no lines in the water, and were just hoping to get some sleep before morning. The night had gotten much cooler though, making sleep or comfort impossible, but finally I managed to get some warmth in a friend's sleeping bag while they slept in my car. After only a few hours of successful sleep I woke to a light haze over the beach. The water was perfectly and eerily still, and the rod still sat exactly as I had left it. As I rubbed the sleep from my eyes I heard yelling and looked down the beach to see someone running towards me. As they got closer I realized it was Dylan, who had been fishing with us the night before and he was yelling "let's do this!". 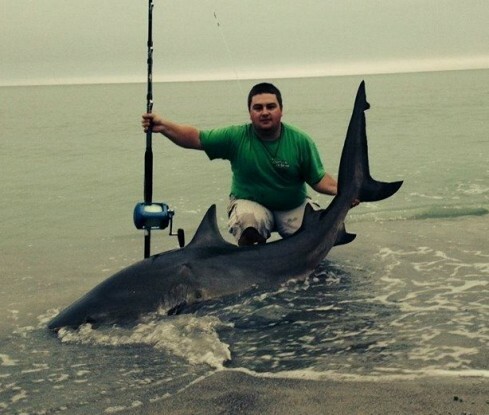 He had stopped by on his way to work at 7 a.m. and decided to go out and retrieve this fish. Before I had even gotten out of my sleeping bag he had jumped into the kayak and was paddling out to the shark. Awoken by the loud exhaust on his truck, Philip and Matt emerged from my car and came walking groggily down the beach. I quickly got up and got a hold of the rod by the time Dylan had reached the fish. We had fully expected this fish to be dead by this time, but suddenly there came a string of expletives from out in the kayak as a large fin popped up beside Dylan and began cruising away. At the same time line began dumping off the reel and I realized that not only was this shark still attached, but it was alive! Dylan paddled back in and I settled into the sand to work the shark the remaining 200yds to the beach. The shark definitely had plenty of strength left and began the fight all over again. It cut back and forth down the beach, but now that it was out of the field of crab traps I let it run. A brief twenty minute battle later and we finally had the fish running in the trough. Matt, Dylan, and Philip leadered the big bull and soon had it on the beach. We snapped a few pictures and cut the leader, and realized it had a large bite mark in its side, likely from mating. It taped out at an even eight feet long, and after high-fiving we pushed it back into the surf. With plenty of energy left she surged back into the gulf to continue roaming the beaches.